29" tall (In Ground Height) wire form holder with the blue glass dish. 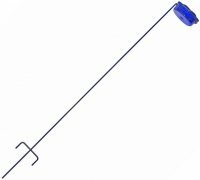 Made with 1/4" Diameter wire and features a welded step in pedal for easy installation. Powdercoated Black.